TV start Gloria Maria enjoyed a family vacation in Ushuaia in March 2016, where she could introduce to her daugthers, Laura and Maria, the wild and beautiful landscapes of Patagonia. The family was hosted at Arakur Resort, a Leading Hotels of the World and Virtuoso member, the best hotel in town – the same one that back in 2015 welcomed a very special guest, Academy Award Winner Leonardo DiCaprio, who stayed in Ushuaia for filming the movie “The Revenant”. 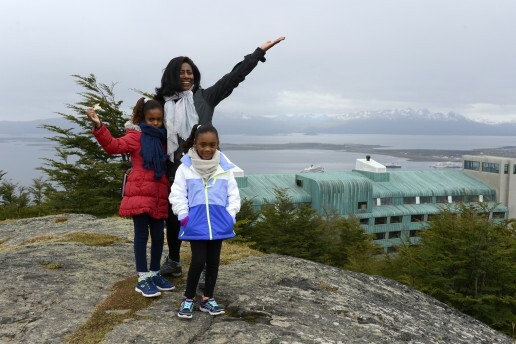 The mother and the two little girls had an amazing time exploring the nature, for example doing a short trekking to Alarkén Mountain – right above the hotel where you can have a 360º view of the city of Ushuaia, the Andes mountain range. They also visited the destination main attractions such as Tierra del Fuego National Park where they boarded in the infamous “End of the World train”, which used to transport Argentina’s most dangerous prisoners in the beggining of the 20th century (1902); they also navigated in the Beagle Channel to watch wild animals like sealions and penguins. As a mother and journalist, whose career allowed her to travel and see the world, Gloria Maria carefully tailored this family trip to Patagonia to introduce out of the ordinary places to her daughters: sea, mountains, glaciars, wildlife in its natural habitat. As well as to challenge the girls, for example to persist in climbing a mountain, and when reaching it, getting the most beautiful view as a gift.